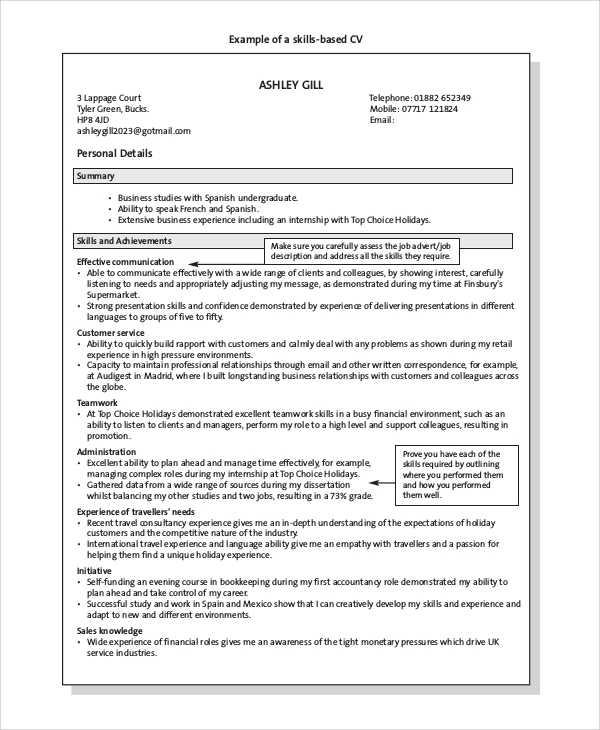 Resume for customer service freshers and professionals plays a major role in securing the desired job easily. They are not like general resumes, and things are more prioritized, and the flow is quite different. It requires references of professional resumes as well as a collection of sample objective statements to impress the interviewer instantly. 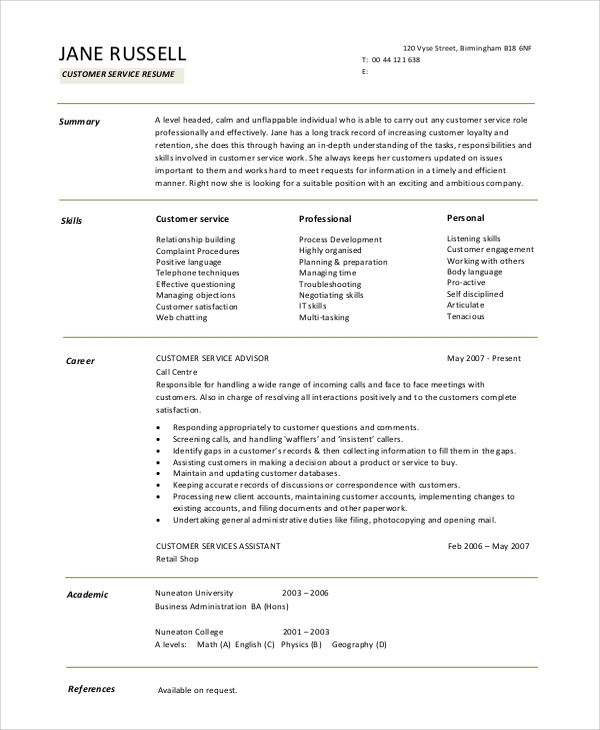 The following customer service Resume Samples are perfect in all aspects, and one can easily write a stunning customer service resume within an hour. 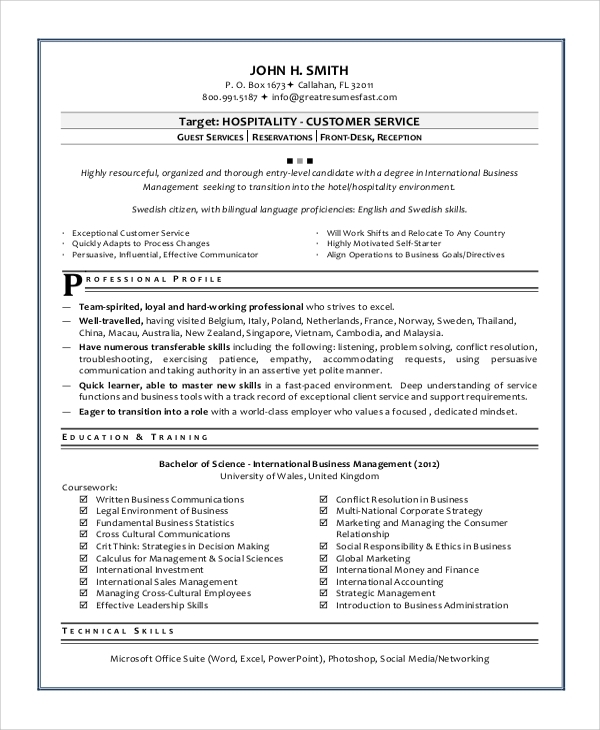 This is a Sample Resume for hospitality customer service. 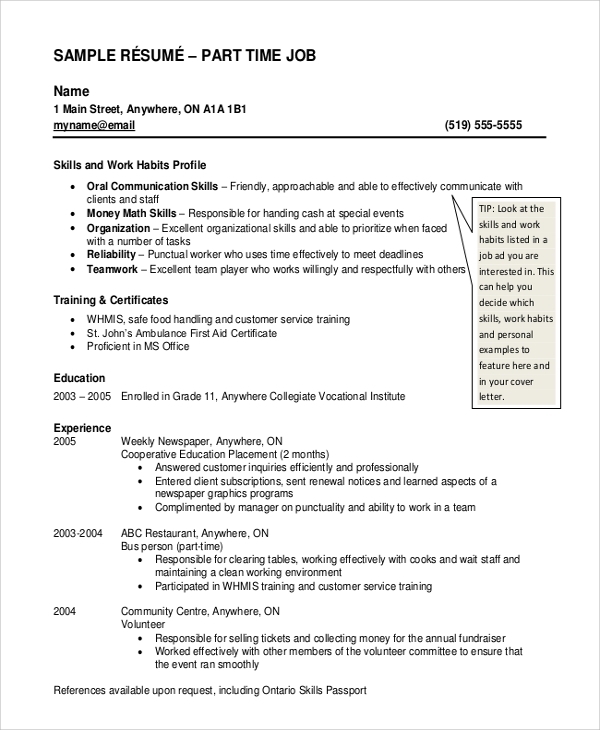 It has a clean and well-decorated resume format and layout. It is going to be liked immensely by the interviewers instantly. It has provisions for the professional profile, education and training, technical skills and other necessities. 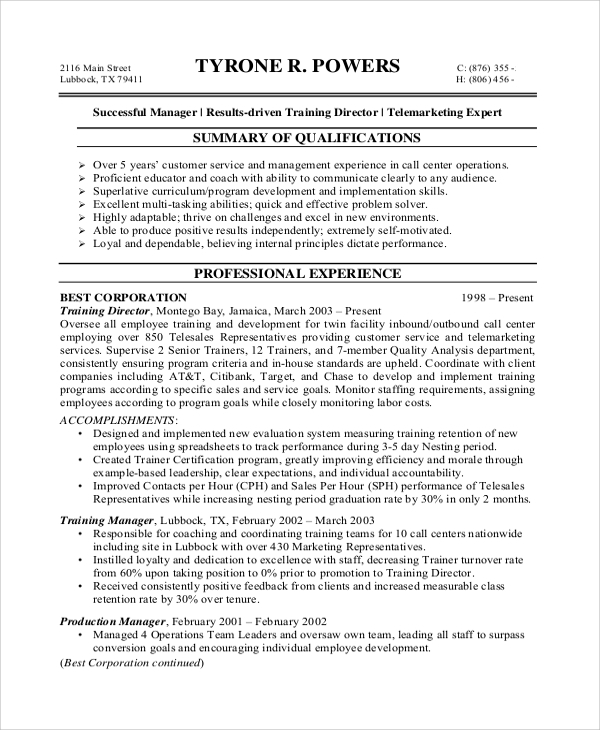 This is a resume sample for customer service advisor. It is a clean layout, and it lists the areas of expertise, career statement, personal details, personal and professional skills in one column and personal summary, career history and duties and past experiences and academic qualification in the other column. 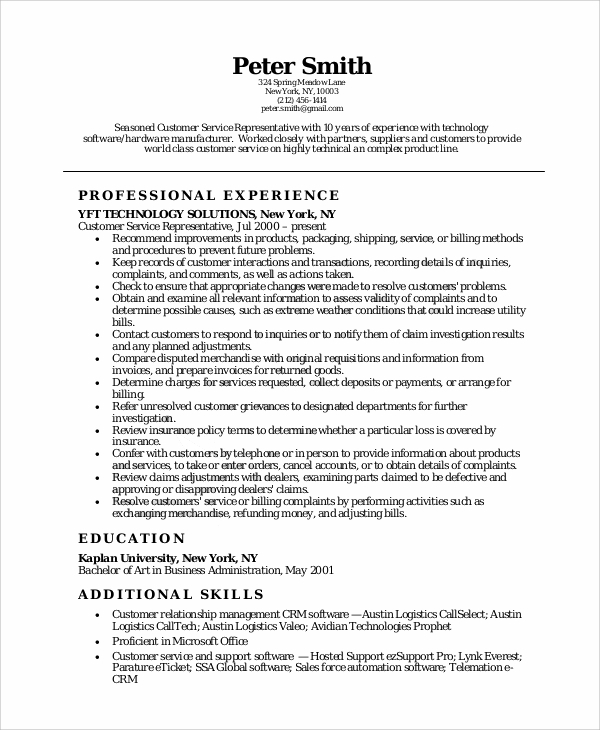 This is a Professional Resume Sample for a customer service representative. It starts with professional experience as it matters the most and moves on to education, professional and additional skills, personal information, personal traits and interest. The provided resume samples for customer service jobs are tailor-made to make a candidate look strong and unique, and the flow and format of the resumes are perfect for the interviewers to get impressed and get all the relevant information at once. There are different types of resumes suitable for various types of jobs in customer service, and a variety of formats will help candidates choose the best one for them both content-wise and design-wise. Additionally, there are Sample Job Objective Statements and sample contents for other sections that one can use with a little improvisation. 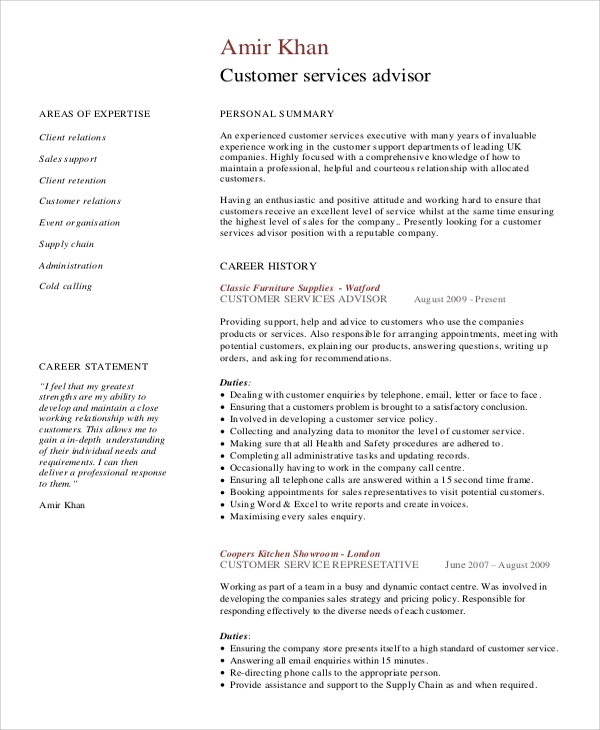 This is an awesome resume for customer service representation. It is beautifully illustrated, and it has headings like personal details with a summary, skills, and achievements and it categorizes roles and responsibilities of past employment wonderfully. There are provisions for education and qualifications, work history, interests, and references. 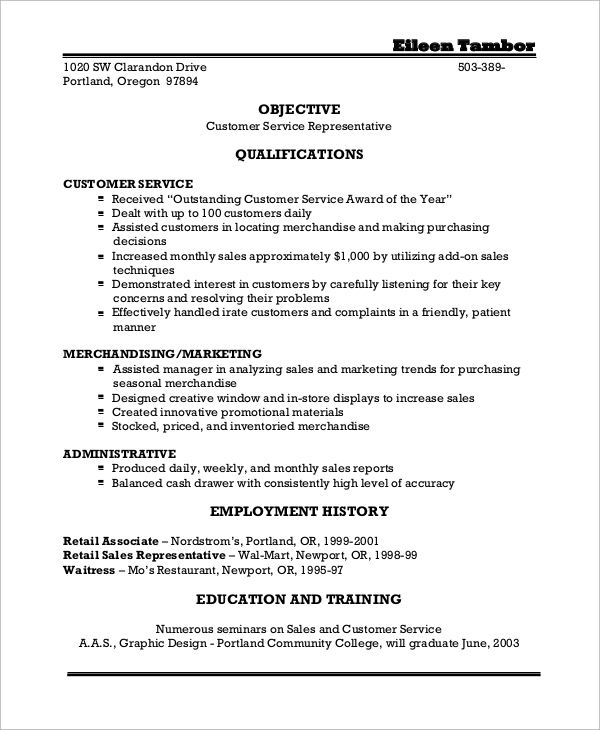 It is an amazing resume format for customer service Resume Objective Samples. It lists the qualifications wonderfully into categories like customer service, marketing and administrative. The similar format is maintained for past experiences and roles. The targeted audiences for the resumes for customer services are obviously the freshers who want to secure a job in customer service industry. They are equally applicable to experienced professionals who are in search of a better job with better pay and duties to perform. Even interested students can use them to apply for internship programs in customer service field. The above-listed Customer Service Representative Resume samples have a creative design, and they are made by professionals who prepared them by being in the shoes of the interviewers. The flow and headings of the resume along with sample statement for career summary, personal summary and career objectives can be used directly with a few modifications and improvisations.